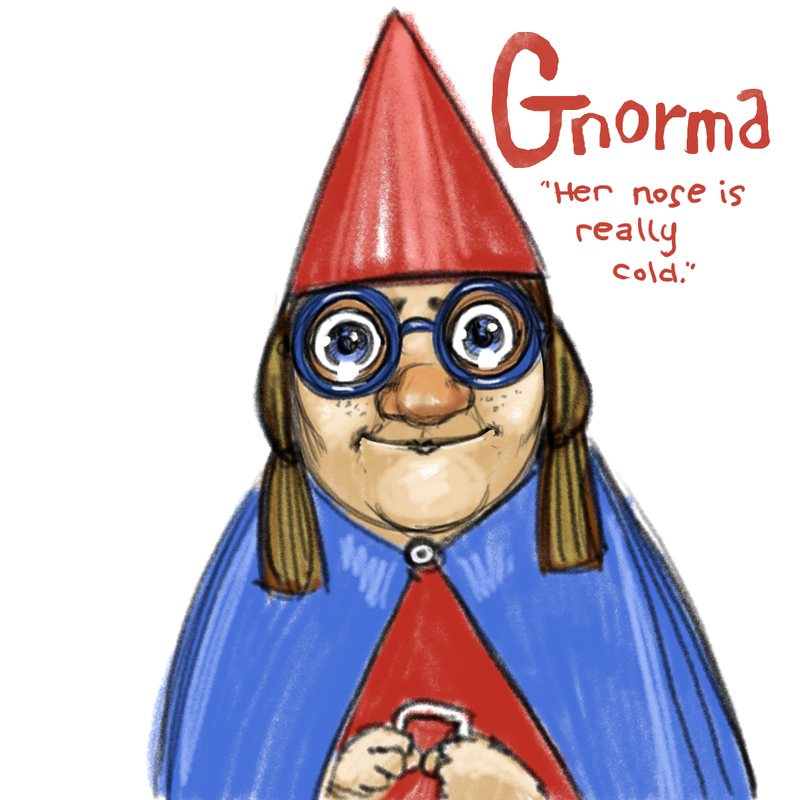 This lady gnome has terrible eyesight. Yesterday's sleepy gnome was named, "Gottfried," by Anonymous (possibly Katharine.) Detail (this is a fun new addition) goes to Jack for "Drank too much Fanta." Now, about that female gnome...Olga, Bluma, or Svetlana. Gertrude. Going trick our treating. She's Annie, and she clearly likes to knit. In addition to winning the baked mushroom competition every year except one, Lyddie is known for her great eye for color. When helping other gnomes choose outfits (whether they want her advice or no), she will take off her glasses so that details don't get in the way and the colors can together. Oh, that's a Doris. She likes Girl scout cookies. Hanna. She bakes by day and rocks out by night. Geraldine, of course. She would have cats, but, well... they are bigger than her. and her nose is really cold. Her name is really Gwendolline Gottfreida Gunnarsdatter, but she likes Mackenzie. When she signs her name, the letters are really tiny and she dots the i with a teeny little smiley face. She knows it's silly and she should be too grown up for such things, but she figures if she writes it small enough that no one will probably notice, and it will make her quietly happy. She is also an enormous fan of Nascar. She root for Jeff Gordon and has a (comparatively) gigantic '24' emblazoned on her gnome-sized Kitchenaid mixer. When a race is on, she will not answer the phone except during commercials, and she might be in a bad mood if Jeff Gordon is having a bad race. who loves children in general. Gretel. What is it with all these G names? But I do think she's a Gretel. Phylis. She loves to go swimming in pools of apple juice and reading gnome romances. All of the bugs in the neighborhood love her, as she is always giving out her homemade treats to them. Grünelda: She loves to go shopping for new books which she reads with a magnifying lens.